Matthue Roth, author of My First Kafka, Never Mind the Goldbergs, and a bunch of other books: Losers. Goldbergs. Sale! Let's say you're looking for the perfect gift for the two coolest, nicest, and most interesting people in the world. And let's say you are a bit of a cheapskate -- but, for the sake of argument, let's say you don't want people to KNOW you're a cheapskate. What's a practical, easy, and brilliant way of getting two awesome presents for basically no money at all (or, alternatively, buying someone a gift and keeping one for yourself)? 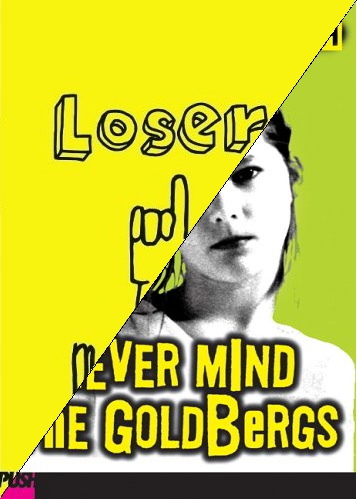 Right now, buy my first book and my newest book, Losers and Never Mind the Goldbergs, for $12 combined. That's less than most single books cost -- unless you're living in Eastern Central Europe or something. Or the only book you read is the free newspaper they give out on the train. To find out more about the books, go here for Losers or for Goldbergs. Or just ask me in the comments. All books come autographed (unless you specify otherwise), and all books come with free goodies, CDs or stickers or whatever I've got lying around. This deal will probably last a couple of weeks, but you probably shouldn't hesitate, because you will forget about it.